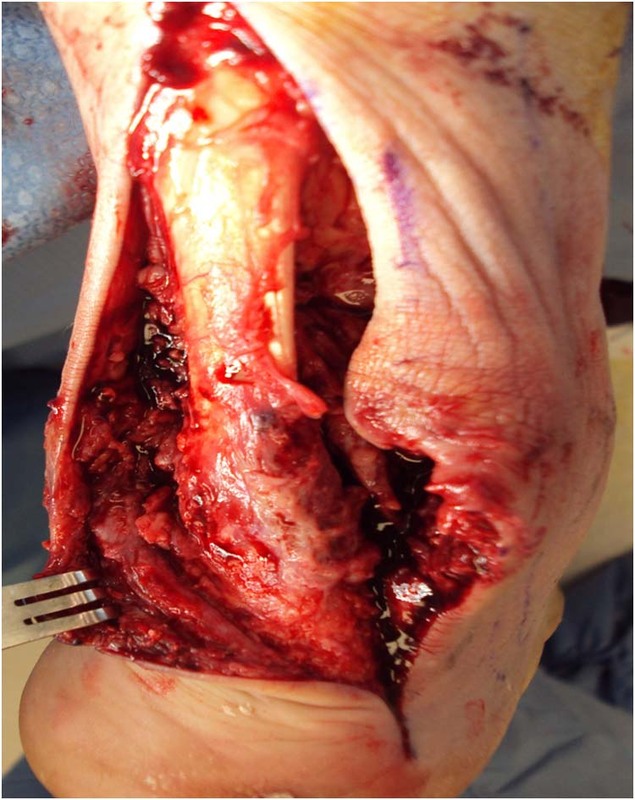 A 62 year old black woman presented with a chief complaint of very painful right big toe of one day’s duration. She denied trauma, fever or prior history of a similar event. Her past medical history includes hepatitis C, and depression. Social history revealed that she does not smoke or drink alcohol and she is a widow. Her current medications include Zoloft and Tylenol for occasional pain. On physical exam she appeared to be in pain while walking. 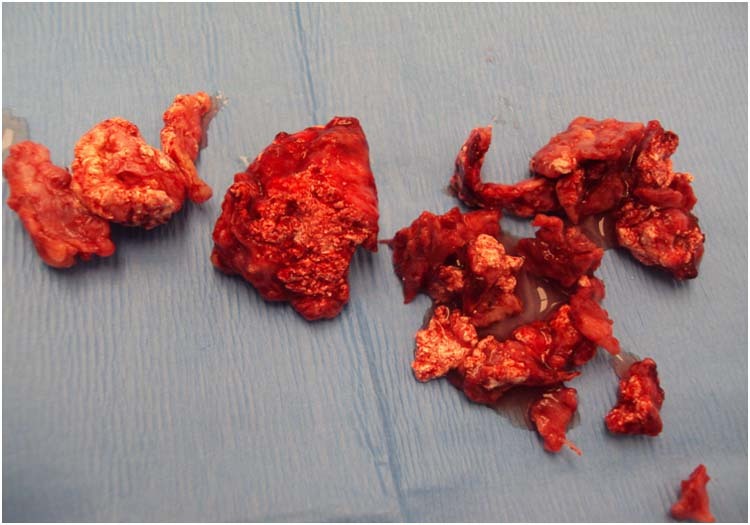 There was an effusion in the right first MTP joint. Skin was warm and exquisitely tender to touch and movement. On lab evaluation, white blood cell count was 6.5 mg per dl with normal differential. The uric acid level was 8.1 mg per dl (reference 2.0 to 7.0 mg per dl). The ESR was 30 mm per hour. Other blood tests including electrolytes, BUN, Creatinine and liver function tests was all normal. 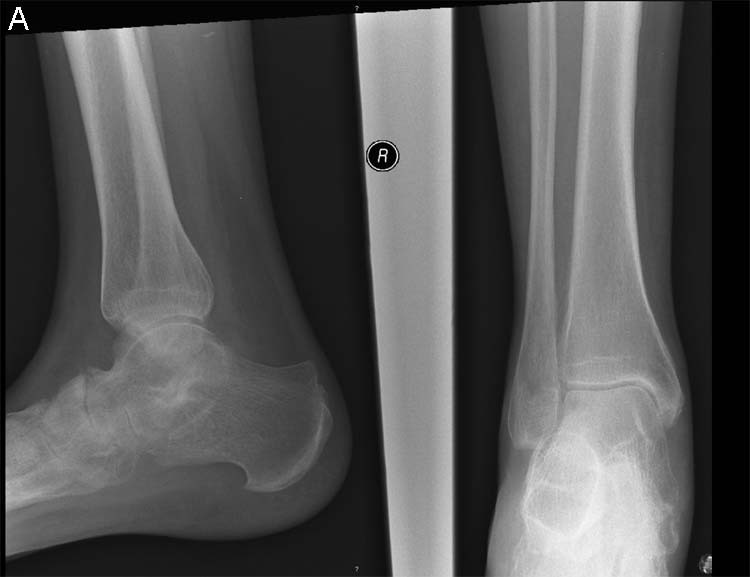 Results of foot radiography are shown in the accompanying figures. 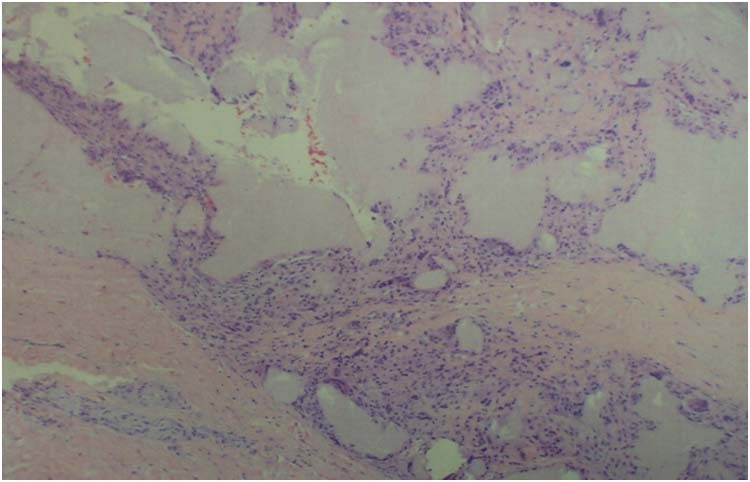 Question: Based on the patient’s history, physical exam and radiographic findings, which one of the following is the correct diagnosis? 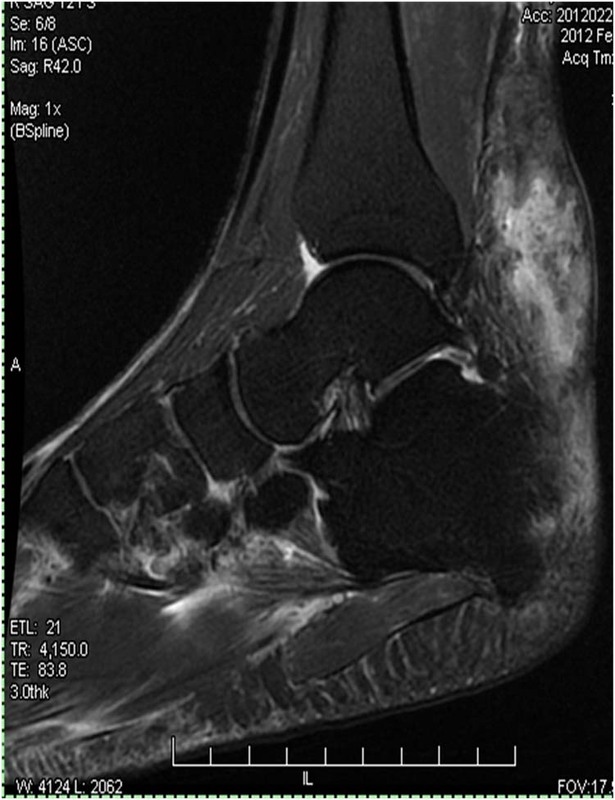 The radiographic image shows right first distal metatarsal fracture (curved arrow) and a lytic lesion. It is important to observe the “Martel’s sign”, which is a radiological sign (straight arrow) to describe the overhanging margin of the new bone along the edge of erosion, named after W. Martel who first described this sign in 1968. Martel’s sign is not present in all cases of gouty arthritis. 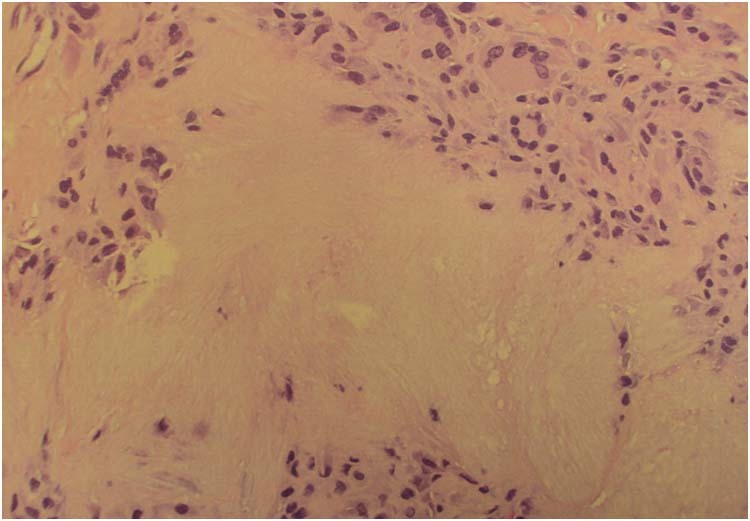 Gouty tophi are masses resulting from soft tissue deposition of urate crystals. 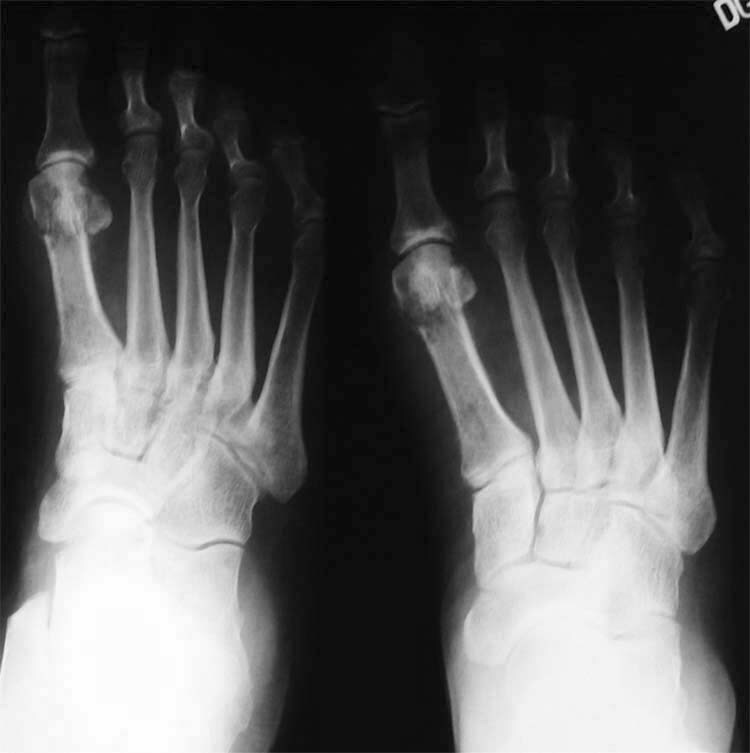 The erosions of gouty arthritis are outlined with sclerotic margins. 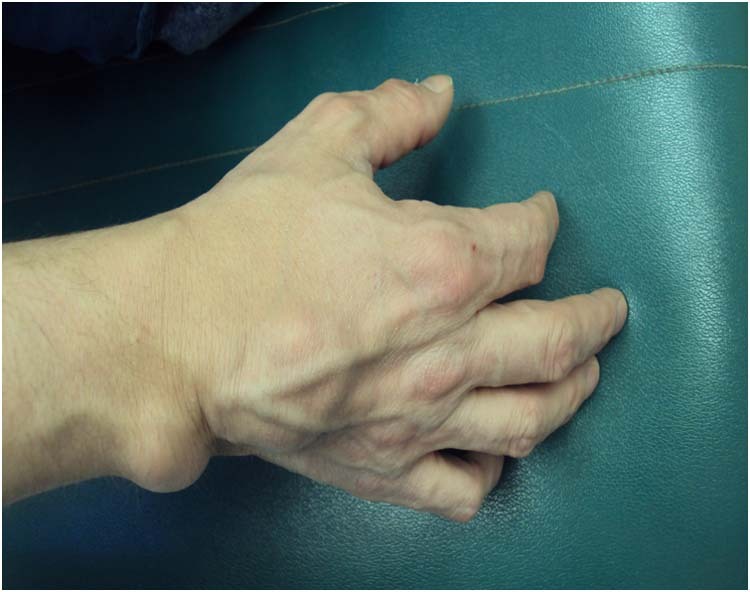 As the tophus erodes the bone, it produces an overhanging C-shaped edge of bone characteristic of gouty arthritis . This gives the characteristic “Martel sign”. 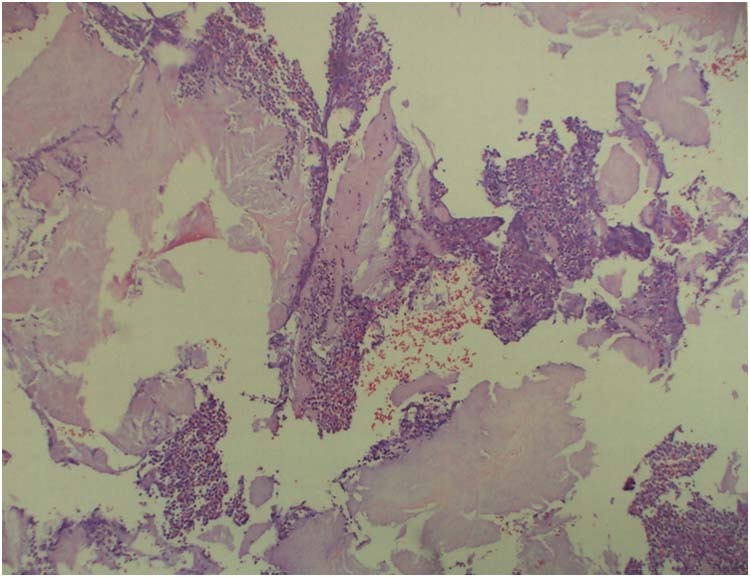 Intraosseus crystal deposition occurs in rare cases. 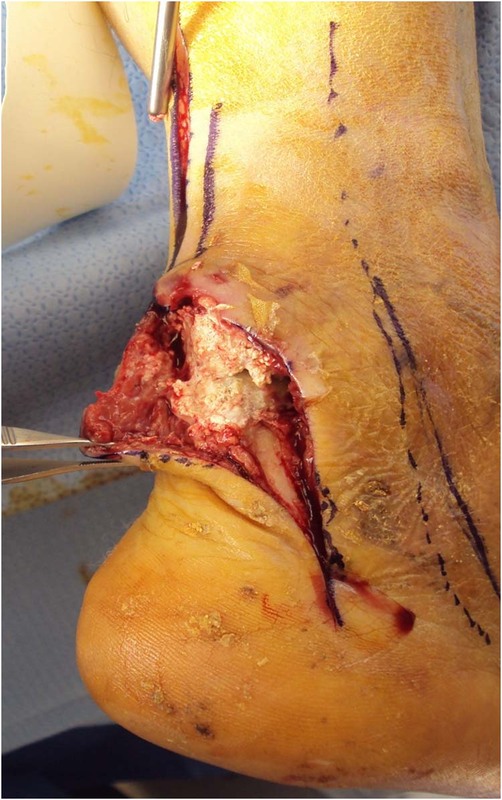 Fracture secondary to gout is rare. 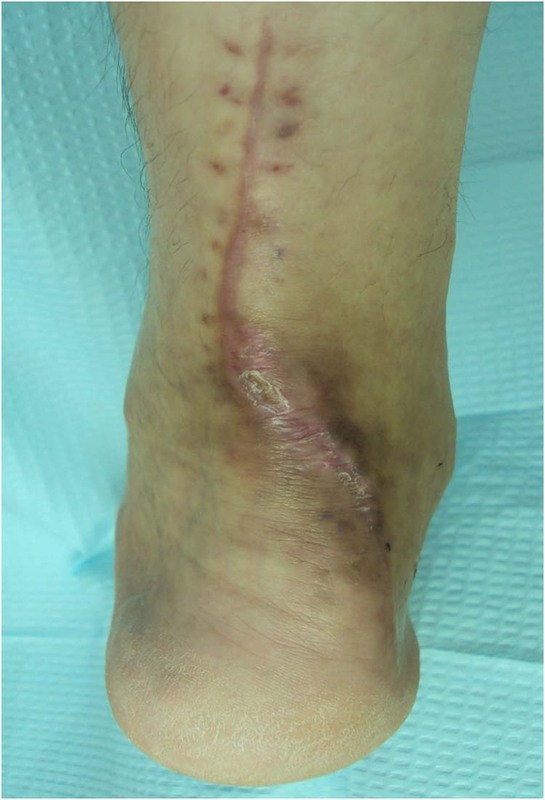 The mainstay of treatment for tophaceous gout is pharmacologic control of hyperuricemia. Treatment can lead to shrinkage or resolution of tophi. 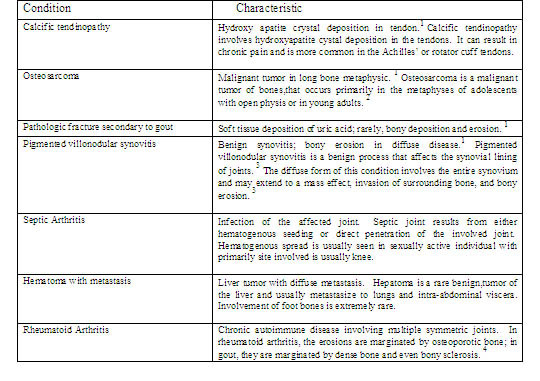 Table: Differential diagnosis for osteolysis on radiograph. 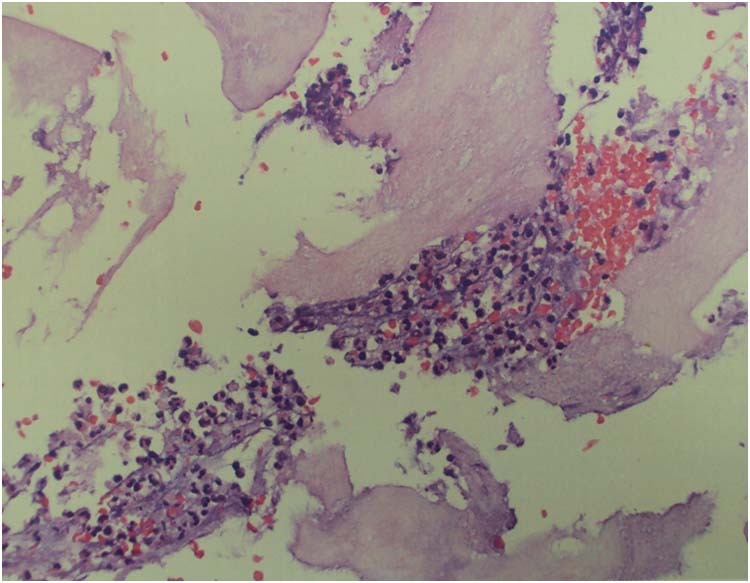 The diagnosis of gout is confirmed by demonstrating negatively birefringent needle shaped monosodium urate crystals in synovial fluid. But in everyday clinical practice, providers often make a diagnosis of gout based on clinical presentation and radiographic findings. 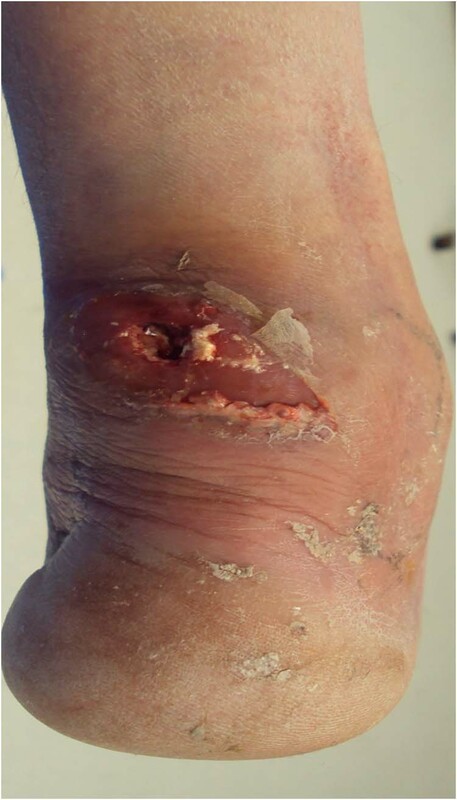 It is important to perform an aspiration on an undiagnosed patient suspected of having acute gout unless the patient has an acute attack of podagra that responds promptly to an NSAID or Colchicine. In the appropriate clinical scenario, a patient with hyperuricemia and classic podagra can be diagnosed and treated empirically. 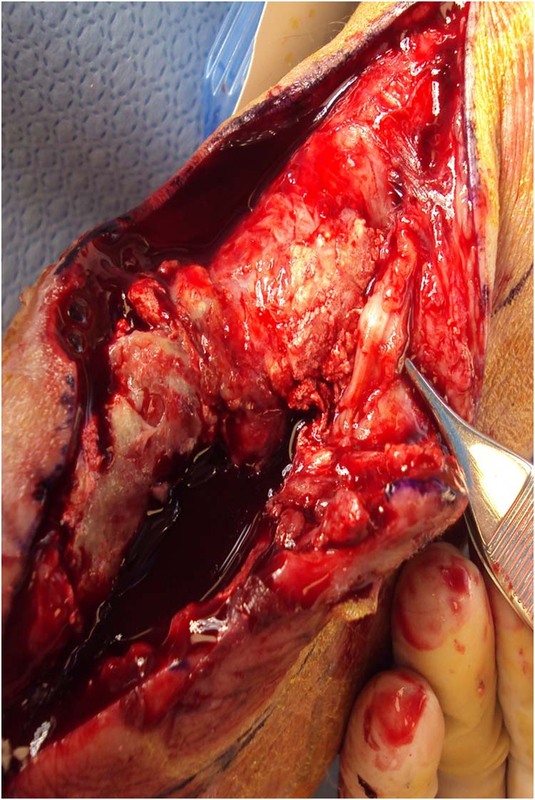 The patient was initially treated with Indomethacin 50 mg three times daily by mouth and Colchicine 0.6 mg three times daily by mouth along with conservative measures including rest, icepacks and elevation of the affected joint. 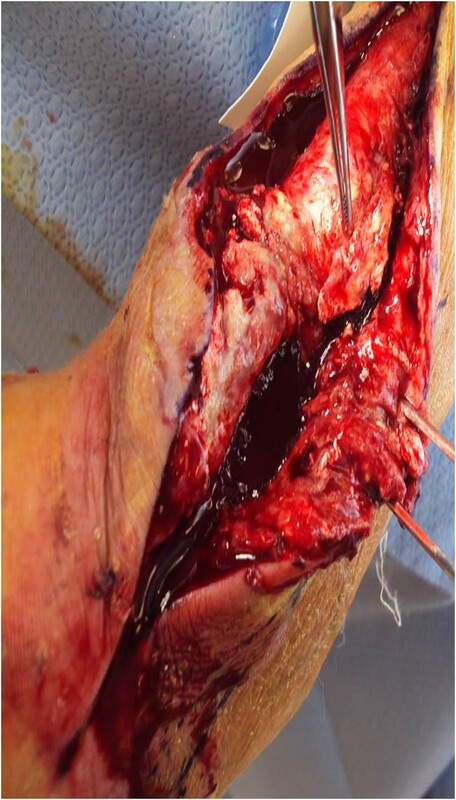 She initially responded well to this treatment but returned to clinic within a few days with worsening pain. 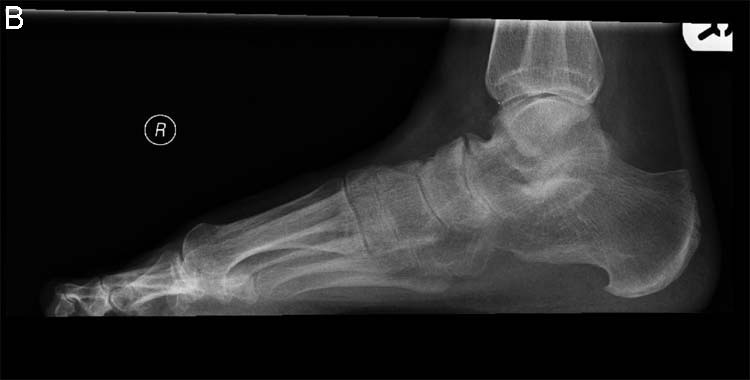 X-rays showed a secondary pathological fracture with Martel’s sign as discussed above. She was given a cast walking boot for stabilization and was continued with the medicine treatment. Follow up uric acid levels after 2 weeks were found to be 7.0 mg/dl. Our patient did respond to the NSAIDS and Colchicine. For that reason, a diagnostic tap was not necessary. Colchicine should be reserved for cases in which the diagnosis of gout is not confirmed and a response may have diagnostic value. 5 Other options to treat acute gouty attacks include intra-articular steroid injection, steroids by mouth. IV colchicine is usually not recommended due to severe side effects such as bone marrow suppression. Long term management, as described above relies on controlling hyperurecemia. Diet control involves avoiding foods rich in uric acid. Allopurinol , a Xanthine oxidase inhibitor, inhibits the breakdown of purines to uric acid and is mostly effective in overproducers of uric acid.. Probenecid is a uricosuric agent and is mostly used for under secretors Twenty four hour urine uric acid levels shall isolate overproducers from under secretors.. Weight loss with moderate exercise is also a very important lifestyle modification necessary to effectively control and prevent future gouty attacks. 1. Arash Nasim, M.D. Bilateral knee pain. American Family Physician; 74-78, 2006. 4. Squire’s Fundamentals of Radiology, Robert Novelline, MD 6th edition, Harvard University Press, 2004. 7. 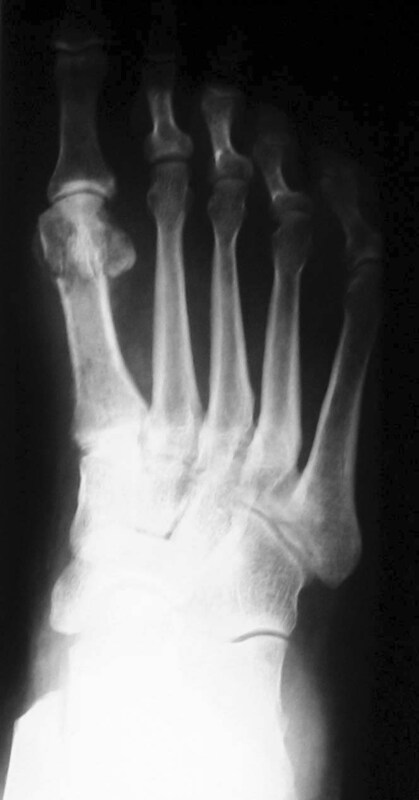 Stephen D. Weissman, DPM Radiology of the Foot, Williams and Williams, 1983.